Org structure and design has failed to keep up with the technological advancement now available to marketing and CX professionals and stopping many from delivering customer success and growth. That’s the view of Salesforce Marketing Cloud’s global chief strategy officer, Jon Suarez-Davis, who caught up with CMO at the vendor’s recent World Tour in Sydney to discuss the ongoing opportunity available to marketers through rapid technology innovation, and what’s hindering their customer success efforts. “There are fundamental org structures and designs that are prohibiting modernisation,” the former media and marketing leader told CMO in an interview. “When I started at Kellogg’s, we wished the technology would do more – it was always a technology problem. I don’t know where this tipping point happened, but in the last couple of years, it’s happened. Suarez-Davis agreed the majority of brands today have made investments into martech and adtech solutions, which they’ve actively using to ostensibly improve and optimising marketing programs and approaches. However, many simply haven’t been able to harness their full capability. One of the reasons is ever-higher customer expectations mean marketers and the technology platforms must connect beyond the four walls of the marketing function and into areas such as service, digital experience, commerce and sales. For Suarez-Davis, this means marketing leaders must be actively striking cross-functional relationships across their organisation if they have a hope of meeting the customer experience standards of their end users now and into the future. As an example of a brand that’s recognised the need for cross-functional collaboration, he pointed to Salesforce customer and online hotels booking engine, Hotels.com. What’s also clear in organisations that are doing well is that they have an obsession with the customer, commitment from leadership, a clear brand purpose, and an almost “maniacal obsession on alignment versus functional domains”, Suarez-Davis continued. “We’re going through this period where we probably need to overcorrect for a while, because we’re so in our silos and functionally derived,” he said. “We’ll overcorrect on this alignment, largely on KPIs that are more consumer-driven and aligned by business goal. Leaders have to also step up and say they recognised a KPI in your patch may not be the right one. Suarez-Davis joined Salesforce exactly a year ago following its acquisition of data management platform (DMP) provider, Krux, where he was the CMO and strategy officer. He spent the previous seven years leading Kellogg’s global media, strategy and marketing effectiveness team. 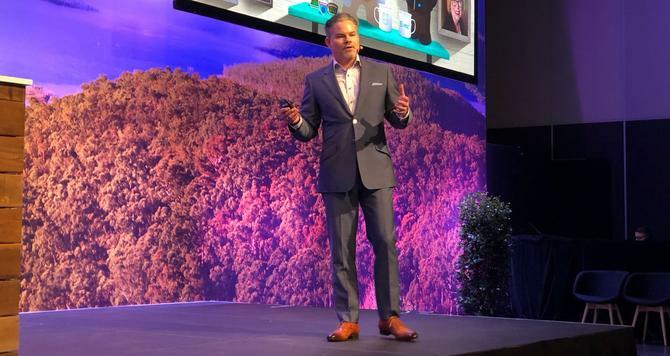 He said the remit coming into Marketing Cloud was refreshingly clear: Build the vendor’s footprint and brand positioning as an enterprise marketing and customer experience platform provider. “Salesforce is the world’s number one B2B CRM. Over the last three years, we’ve made significant investments on the B2C side, including social acquisitions such as Radian 6 and Buddy Media, then ExactTarget,” Suarez-Davis said. As customer experience becomes the key to competitive advantage, the lines between sales, service and marketing are blurring. That’s something Salesforce is keen to capitalise on and through its increased integration of Marketing, Service, Sales, Commerce and Community Cloud offerings, looking to dominate the market in. According to Suarez-Davis, this shift is being matched by trends in the marketplace around the changing role of the chief marketing officer. He pointed out marketing titles are transforming into roles such as chief ideas officer, chief growth officer, chief customer officer. “These are reflective of this blurring of the line and the fact that markets are getting a broader remit that includes customer service channels, commerce and more,” he said. It’s also incidentally, something CMO found in its 2017 State of the CMO research report. Across the more than 100 Australian marketing leaders surveyed, 78 per cent reported that the digital commerce function was reporting directly into marketing. In addition, six in 10 owned customer experience, one-third customer care and service, and 39 per innovation. As a former marketer and marketing chief, Suarez-Davis has also seen first-hand how much the role has changed. As Salesforce looks to integrate all of its different platforms, Suarez-Davis said the vendor also has to encourage cross-functional alignment. “The idea behind the customer success platform, which is fundamental to our business, means putting the customer at the centre,” he said. “We have something call the V2MOM model, which is how we run our business. And it’s a planning and disciplinary approach. We’re putting integration at the heart of what we’re doing. Looking then at the position of the CMO, Suarez-Davis said it’s vital to surround yourself with cross-functional talent. “The ones we seeing as progressive are bringing in IT, finance, supply chain and customer service within the functions they have,” he said. “They’re also infusing new talent into the organisation that many have not had. The other massive area of focus for martech vendors is on AI. At Salesforce, this has manifested through Einstein, a growing framework of AI/machine learning capability that it’s materialising through functionality such as image recognition, predictive analytics and automated customer recommendations. Suarez-Davis said the vendor’s recent State of the Marketing report, found upwards of 50 per cent of customers using AI today believed it is critical in their ability to deliver personalised, consumer engagement at scale. For Suarez-Davis, there isn’t just one way of looking at how AI will impact the tasks done by marketers. “We have some customers that depending on how tough their category is and where they live, who look at AI through lens of streamlining, efficiency and taking a manual process and streamlining it,” he said. “Businesses will always try and do that. But I would say that’s a relatively short-term view of it. How can it help us get closer to the consumer and drive growth is the longer-term game.